Here is a small PhysX demo for testing purposes, created with GLSL Hacker. This demo, based on the latest beta version of PhysX 3.3, uses the cloth module of the PhysX engine and shows animated flags made up of 50×50 vertices. 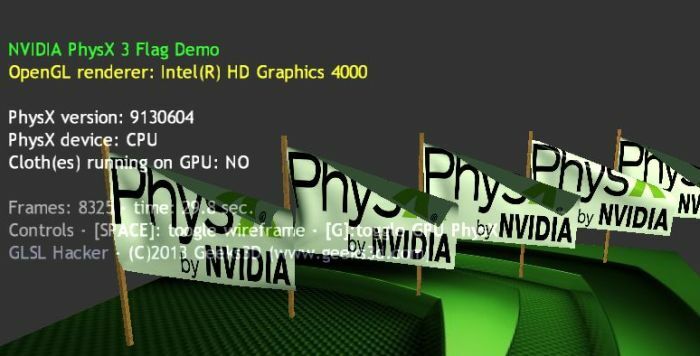 The demo also displays some information about the PhysX device using functions available in PhysX 3 SDK. The demo is coded in Lua and shows the use of Lua modules. And the Linux version ? It should be available shortly, as soon as I will have fixed a linking issue with the PhysX libs. Two words about GPU PhysX. GPU PhysX in the current PhysX 3.3 SDK is only available for cloth and particle modules. 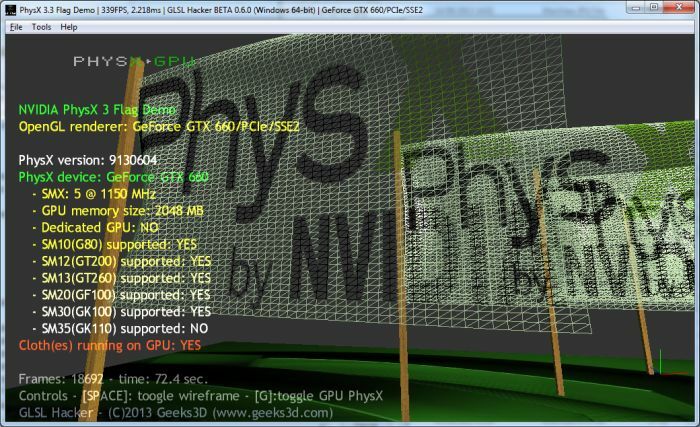 And GPU PhysX is available only under Windows. 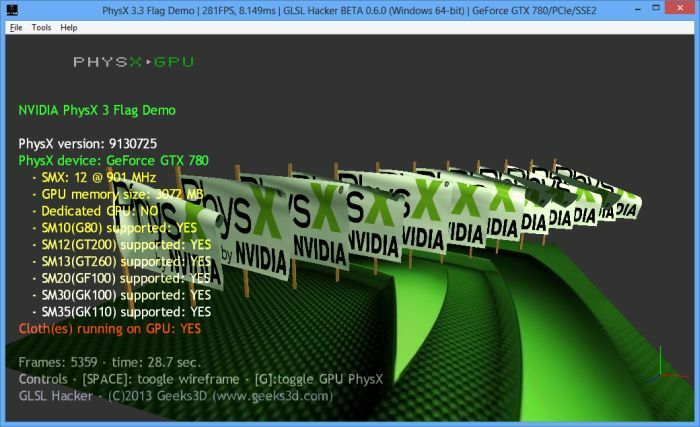 But good news, a trusted source told me that GPU PhysX is also planned for Linux and OS X (the bad news: the release date is not yet planned…). But there is a constraint: the number of vertices of the flag. To get the max performance, the grid that shapes the flag must have around 2500 vertices (50×50) to fit in GPU shared memory. As soon as you use a grid with more vertices (80×80 for example), there’s no difference between the GPU and the CPU. 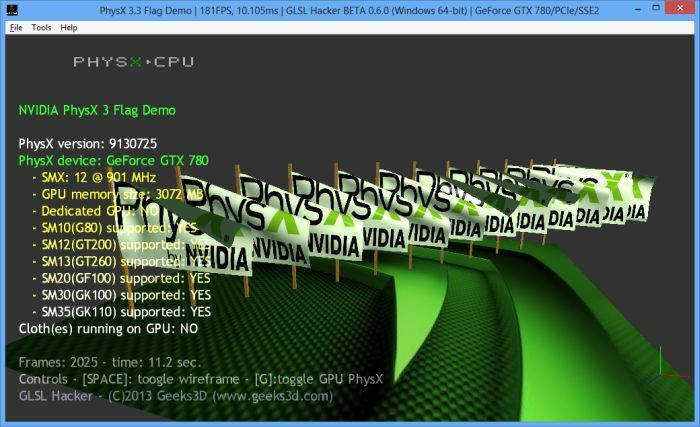 It’s even worse, GPU PhysX getting slower than CPU PhysX! In the demo, the each flag is made up of 50×50 vertices. You can change this number in the demo (file: PhysX3_Flag_Demo/demo/physx3_flag_v2_gl3.xml, line 100). CPU PhysX is perfect for low number of clothes or for clothes with more than 3000 vertices. But for many clothes with around 2000 vertices, GPU PhysX is the solution. 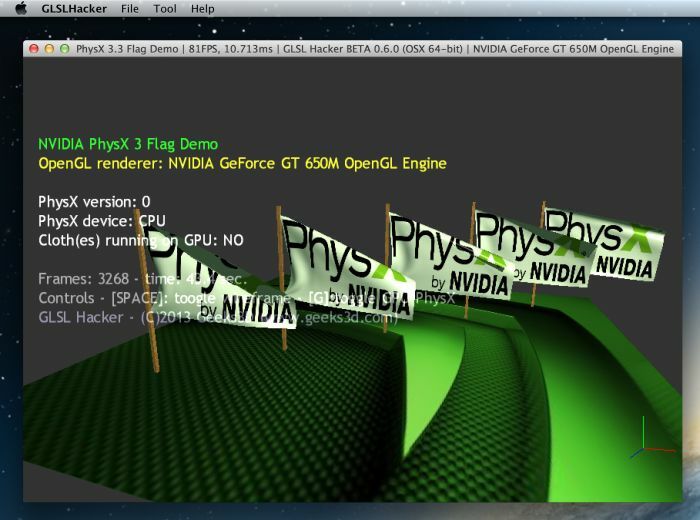 Unzip the archive somewhere, and launch PhysX3_Flag_Demo.exe (Win64) or PhysX3_Flag_Demo.app (OS X). The source code (Lua + GLSL) is available in the demo/ folder. hah this is fun to play with, thx! I’m using the demo on my 3770k @ 4.5ghz and have been playing around with the amount of flags and the vertices. For me at 25 flags with 80×80 they start to do a wave like interaction with each other (getting ~40fps). I’ve also tried 100 and 50 flags. I was wondering where I could modify how much wind there is. Any idea if I run it on a GTX 660M card then pressing ‘G’ won’t do anything, so can’t change to GPU? is it something with the card? 2/ the mapping of the G key does not work on your machine (???). Try other keys, maybe you will find the right one. I have a 570GTX and with 15flags it stresses only ~ 60% of my gpu, how can force more flags? for example 18 or 20.